Sometimes, what you want from a biography is the basic, most important highlights of someone’s life. Sometimes, the best biography is the simple, straightforward story. I am confident that if I wanted to know everything there is to know about J. R. R. Tolkien that I could find volumes written about him. But what I was most interested in is how he came to write The Hobbit and The Lord of the Rings. This book answered these questions. And as with most writers, the important aspects of their lives helps shape the things they write, and biographer Devin Brown gives us those highlights. I’m not very familiar with Tolkien other than reading much of his work, but I wasn’t looking forward to massive biography like some of those I’ve read recently. An in-depth biography is extremely time-consuming. But I did want to learn something about Tolkien, and I did, making this book a complete success for me. Given the renewed interest in all things Tolkien, due to the films, this book is perfect for the average high school student and for anyone wanting a quick, informative bio. This is the sort of book that can turn the reluctant non-fiction reader into a biography fan. This would make a great beach read! Looking for a good book? 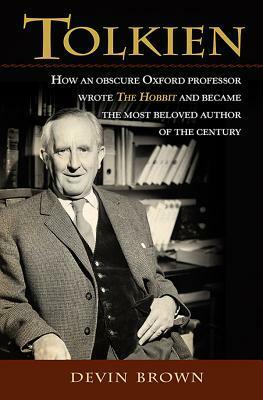 Devin Brown’s biography on J. R. R. Tolkien is simple, sweet, and satisfies.